Investigation of Umm al-Hiran incident reveals police fired at the car where their commanding officer was sitting. New details have emerged Wednesday from the investigation of conduct of police during the Umm Al-Hiran shooting last month in which policeman Erez Amedi-Levi and Yakoub Abu El-Kian were killed. 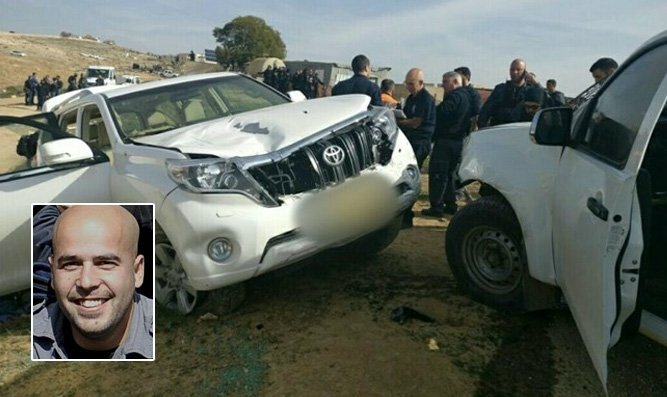 During the course of the incident shots were fired at Abu El-Kian's car but because of a mistaken identification, shots were also fired at the car of the Chief Inspector of the Yoav police unit. The inspector's car was hit by ten bullets while he and another officer from the unit were sitting inside it. Miraculously they were unharmed. A mistaken identity led to the shooting since the police were sitting in an unlit car. The shooting stopped only when the inspector demonstrated resourcefulness and put on his flashing light. A police source said that "a policeman who must have been under pressure shot the first shot and the moment everyone heard shots they all joined in. The amount of bullets shot there was crazy, tens of bullets." On Wednesday journalist Kalman Liebskind revealed in a Channel 20 report new details on the Umm Al-Hiran affair, stating that "the internal investigation revealed problematic functioning on the part of police in the area including friendly fire by forces from two different units. This tragic event could have ended very differently. The version of a terror attack does not seem to have any support."